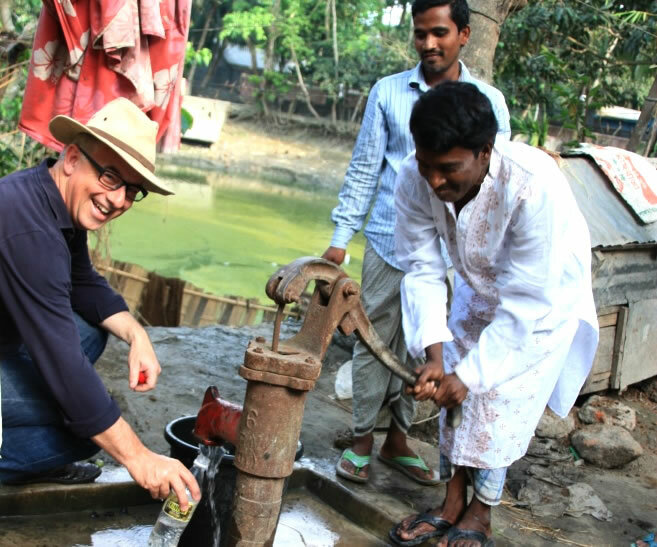 REACH Programme Director, Dr Rob Hope, has been meeting with country partners and identifying potential Water Security Observatories in Kenya, Ethiopia and Bangladesh. The journey began in March when Rob travelled to Kenya to meet with UNICEF and University of Nairobi staff and discuss possible research themes. Several important topics were flagged, including: rural groundwater risks, water security and migration, and natural infrastructure approaches. A major aim of the country visits was to identify potential ‘Water Security Observatories’ or research locations where major and uncertain changes are predicted, and where water and poverty challenges intersect. These observatories will be the subject of long-term interdisciplinary studies undertaken by our research team and partners. For the second round of visits Professor David Grey, Visiting Professor of Water Policy at Oxford University, joined Rob in Ethiopia. They met with the Minister of Water, Irrigation and Energy, as well as with UNICEF staff and researchers from the Water and Land Research Centre at the University of Addis Ababa, all partners in the programme. Water supply in rapidly growing small towns was identified as a research theme with high potential for impact, linking with UNICEF’s existing work on this area. Vulnerable drylands, sustainable growth and the effects of climate change on water resources were also discussed. In April, Rob was joined by Anita Ghosh, our Interim Programme Manager, in Bangladesh, the last destination of the country visits. After several days of productive meetings in the capital Dhaka with the UNICEF country office, Bangladesh University of Engineering and Technology (BUET) and researchers from the University of Dhaka, they moved southeast, offering a welcome respite from the intensive Dhaka traffic. The International Centre for Diarrhoeal Disease Research, Bangladesh (icddr,b) hosted a visit to Matlab, in the Comilla District, home to one of the longest running demographic and health surveillance sites in a developing country. With data going back to 1966, Matlab offers an exciting opportunity to combine these unique records with climate and water data in order to analyse and improve water security in the area. The key research needs that were identified for Bangladesh include lowland and coastal water security, the Dhaka garment industry, and issues of quantity and quality of water for drinking and irrigation. After these successful initial visits, the Oxford team will be returning to all three countries over the next few months, to strengthen and finalise the programme of work.